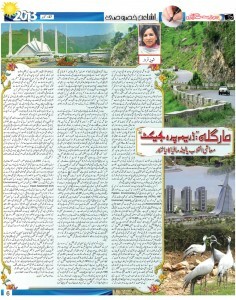 Questions regarding Margalla Hills tunnel ! The Capital Development Authority (CDA) is currently working on an estimated US$12 billion mega-project which includes building a twin capital across the Margalla Hills, connecting the two with a tunnel. Prime Minister Nawaz Sharif, despite severe opposition from politicians and members of the civil society, has directed CDA to continue working on the project. The digging of tunnel in Margalla Hills a sheer violation of the law governing the Margalla Hills National Park. Firstly, building a tunnel through the Margalla Hills would be a flagrant violation of the laws covering the Margalla Hills National Park, which is protected from construction of any kind under the law of the land. Secondly such a tunnel through the beautiful Margalla Hills would be a serious threat to the environment of Margalla Hills National Park and Islamabad and this would cause irreparable damage to the ecology and beauty of Islamabad, which is one of the most beautiful capitals of the world. Thirdly, this decision seems to have been taken in a hurry since even the official procedure for processing and permitting such projects has not been followed, as such projects require approval of the Planning Commission and sanction by the ECNEC as well as the NOC of the Environment Protection Agency. The Supreme Court has also taken a suo motu notice of the project and sought replies from the government. DHAKA, Bangladesh (Thomson Reuters Foundation) – At a time when climate change scientists and activists are calling for large-scale forest protection and reforestation to counter the impacts of climate change, the government of Bangladesh is cutting down large areas of forest to clear land it says is needed for human settlement and border security posts. The low-lying country is among the countries most affected by climate change, suffering from poor rainfall, droughts, cyclones, river bank erosion and flash floods. These hazards have become increasingly frequent, exacerbating poverty and triggering massive migration to the country’s cities. Although Bangladesh has received praise for its disaster preparedness and for its pioneering efforts to adapt to climate change, the government has raised concerns among environmentalists and others by taking steps to clear forests, including on protected land. In the coastal district of Cox’s Bazar, which borders Myanmar, officials of the Bangladesh Border Guard have applied to the ministry of the environment and forests to take over 40 acres of forest, 90 percent of which is reserved woodland, in order to make room for a security post for a battalion of the guard. The ministry of home affairs says the post is needed to prevent illegal immigration by ethnic Rohingyas from Myanmar, as well as smuggling. Even though the land has not yet been officially allocated by the environment ministry, trees have already been felled. The forest department had established an arboretum on 20 acres of the land that is now being cleared, and had plans to expand it up to 200 acres. Some of the land was also designated for a plantation of 37,500 trees under the Bangladesh Climate Change Resilience Fund, a financing mechanism coordinated by the government. The plantation project has had to be relocated. The government is also establishing a settlement for several thousand people in the Gazipur area, some 30 km (19 miles) from the capital, Dhaka, for which the Capital Development Authority has acquired 650 hectares (1,600 acres) of forest and agricultural land since 1995. Protests by local people and environmental activists prevented authorities until recently from cutting down trees and taking full possession of the land, but since May of this year the trees have been felled and authorities have begun developing the land for housing. Hundreds of thousands of trees have been cut down and wetlands filled with sand, according to Abu Naser Khan, chairman of Paribesh Bachao Andolon (Movement to Save the Environment). The environmental impacts of the deforestation of such a vast area were not considered, Khan said in a phone interview. “Saving nature is very much crucial to keep the earth liveable for human beings. Much more tree plantation is also needed to offset the impacts of climate change,” Khan said. Civil society organisations and environmental activists are protesting the destruction of forests, a move they say breaches environmental laws and is contrary to the government’s own policies. Activists have held protests on land that is being deforested, as well as in Dhaka. Meanwhile, the Bangladesh Environment Lawyers Association has filed a case in the High Court seeking the cancellation of the Gazipur resettlement project. A bench of the court suspended a previous order allowing the government to carry on the project. A final resolution of the case is still pending. The Bangladesh portion of the Sundarbans mangrove forest, a UNESCO World Heritage site, is also under threats from deforestation by encroachers. A study published last month by the government’s Soil Research Development Institute found that some 50,000 hectares (124,000 acres) of land in the Sundarbans were deforested by individuals and businesses between 2000 and 2010, representing a loss of 8.3 percent of the total area of the world’s largest mangrove forest. The land was mainly converted to shrimp farms, according to the study. The mangrove forest helped protect populations in coastal Khulna, Satkhira and Bagerhat districts during the massive cyclones Sidr and Aila, which hit in 2007 and in 2009, said Atiq Rahman, executive director of the Bangladesh Centre for Advanced Studies, a non-governmental organization that works on sustainable development issues. According to Rahman, had there had been no forests in these districts, the damage from the two cyclones could have been much greater. Ainun Nishat, an environmentalist and vice chancellor of Brac University in Dhaka, expressed sadness over the destruction of forest for the border battalion post. “We need massive afforestation to cope with the impacts of climate change. We should try to save the forests as much as we can,” Nishat said. According to Nishat, the impacts of climate change are becoming ever more evident. “We have to be more prepared to face unusual happenings in the coming months and years,” he said. SRINAGAR, India (Thomson Reuters Foundation) – Devastating flooding in the northern Indian state of Uttarakhand in June, caused in part by the collapse of a glacier-fed lake, has raised worries in other Himalaya regions could be at risk of similar tragedies, experts say. In southern Kashmir, in particular, a number of glacial lakes in the upper reaches of the famous tourist resort of Pahalgam could be vulnerable to collapse if the region faces extreme rainfall or earthquakes, scientists say. “The Uttarakhand tragedy has rung alarm bells for the entire Himalayan belt, considering its fragile ecology and environment. Since we are the part of the same fragile Himalayan belt, any extreme meteorological event could create havoc here as well,” Mohammad Sultan, head of the department of geography and regional development at Kashmir University, told the Thomson Reuters Foundation. Nijhum Island in Noakhali becomes a climate vulnerable area due to deforestation. River erosion and over population in that island also increasing the risk factor. The local people suspected that, the forest was green belt in that island, but the deforestation may increase the intensity rate of natural disaster. This can be controlled by awareness build up program and increasing regular monitoring system of government. This vulnerable island in the southern part of Bangladesh is also a natural resource which should protect for our own environment conservation. With the help of local correspondent, this story has done and continues with the possible solution from natural disaster. The people also explain their present condition as well as the role of local government body is come out by their statement.